Yesterday's flurry of news about Matt Reeves' The Batman and James Gunn's Suicide Squad relaunch show the new direction being taken over at Warner Bros. It's clear they're moving as far away from Zack Snyder as possible creatively, in response to bad reviews and disappointing box office, capped off by the drubbing Justice League took. Seriously, how can that movie make less than $700M worldwide? How does that happen? It doesn't matter now, but things could have been very different if just one of Snyder's films had been a smash hit, and Kevin Smith is here to tell us just how different they might have been. 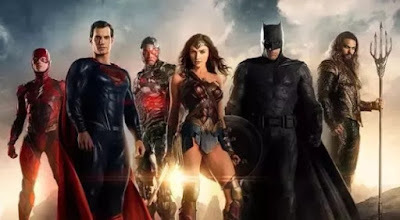 Speaking on his Fatman Beyond podcast, Smith reveals details he learned during meetings he took with creatives on Justice League in the special effects department. He says superstar artist Jim Lee was hired to do storyboards for what would have been three movies in total. We knew Snyder wanted at least two, which were initially going to be shot back-to-back, but now we know there would've been an entire trilogy, and here's how it would've broke down. Justice League Part One would've been essentially the same as what we got in theaters, the only difference being the conclusion. After Steppenwolf's defeat (such a forgettable villain!!! ), the team would've been faced by the real threat, Darkseid, who would arrive in a boom tube. The big reveal here is that the scene teased in trailers but cut from the movie, in which Alfred says "Let's just hope you're not too late", would've referred to Green Lantern and not Superman as we all thought. This would set up the sequel to be set in space. Part Two would've followed up on that, with the League traveling to Darkseid's home planet of Apokalips for a confrontation, which they would lose in epic fashion, with Darkseid then making his way to Earth and destroying it, creating the apocalyptic vision we glimpsed briefly in Batman v Superman. Also, the Green Lantern Corps would be aiding the heroes in the fight. Doesn't sound like they helped all that much. Part Three is pretty much the team finding a way to defeat Darkseid, with the look of the film resembling the post-apocalyptic vision seen by Batman in Batman v Superman. Pretty straight-forward, really. I hate to say it would've been better than the weird hybrid Joss Whedon ultimately gave us, because we just don't know, but at least it would've been Snyder's singular vision that played out, and I'm a firm believer in giving filmmakers free rein to tell their stories. I expect this will only enhance calls for a "Snyder Cut" of the film, although that's unlikely to ever happen.